Whirlpool 4.8 cu.ft. capacity electric range with custom broil. 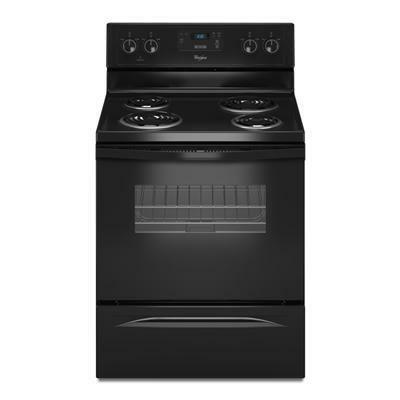 The freestanding range features 4 coil elements, upswept porcelain SpillGuard™ cooktop, clock and timer, 2 adjustable oven racks and storage drawer. Additional Information Custom Broil: Allows you to set your preferred broiling temperature in 5-degree increments between 170° F and 500° F. High heat is best for grilling meats, while low heat is ideal for delicate tasks such as melting cheese. Upswept Porcelain SpillGuard™ Cooktop:Helps contain messes and makes cleanup easier with the raised-edge design. 2 Adjustable Oven Racks. Warranty For one year from the date of purchase, when this major appliance is operated and maintained according to instructions attached to or furnished with the product, Whirlpool Corporation or Whirlpool Canada LP (hereafter “Whirlpool”) will pay for Factory Specified Parts and repair labor to correct defects in materials or workmanship. Service must be provided by a Whirlpool designated service company. This limited warranty is valid only in the United States or Canada and applies only when the major appliance is used in the country in which it was purchased. Outside the 50 United States and Canada, this limited warranty does not apply. Proof of original purchase date is required to obtain service under this limited warranty.